This book demonstrates that we need not choose between seeing so-called Presocratic thinkers as rational philosophers or as religious sages. In particular, it rethinks fundamentally the emergence of systematic epistemology and reflection on speculative inquiry in Hesiod, Xenophanes and Parmenides. Shaul Tor argues that different forms of reasoning, and different models of divine disclosure, play equally integral, harmonious and mutually illuminating roles in early Greek epistemology. Throughout, the book relates these thinkers to their religious, literary and historical surroundings. 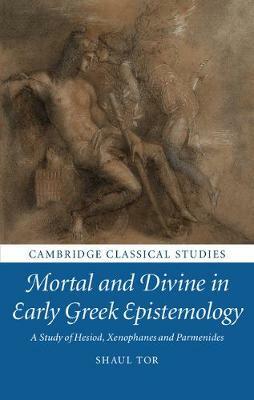 It is thus also, and inseparably, a study of poetic inspiration, divination, mystery initiation, metempsychosis and other early Greek attitudes to the relations and interactions between mortal and divine. The engagements of early philosophers with such religious attitudes present us with complex combinations of criticisms and creative appropriations. Indeed, the early milestones of philosophical epistemology studied here themselves reflect an essentially theological enterprise and, as such, one aspect of Greek religion.